The story resonates in headlines today. In the midst of a long depression, a cabal of unassimilated foreigners hatch a plot to seize control of a city’s schools, replace one holy book with another, and turn the classroom into an indoctrination camp for their own creed. Whipped into a frenzy by the press, native-born citizens turn on the immigrant group as a whole, and angry nationalists carry their flags into the no-go ethnic enclaves of the metropolis. An anti-immigrant political party, railing against politics as usual, turns native rage into votes and sweeps seasoned politicians out of office. Those on the left look on helplessly as the divisions of creed and culture fracture working-class unity. This is not Birmingham in 2014, though, but Philadelphia in 1844: the year of the Bible Riots, two of the deadliest outbreaks of street violence before the Civil War. The ‘foreigners’ meanwhile were not British Asians but Irish Catholics. Over the preceding decades, Catholic emigration to the U.S. had gathered pace, but the hard times that followed the financial Panic of 1837 and the militant Protestantism of the Second Great Awakening made the Irish an unwelcome presence. Citizens competed with them in the labour market and condemned their craven dependence on the anti-Christ in Rome. Ethnologists often saw Celts as an inferior race and doubted their capacity for self-government. How after all could any liberty-loving citizen bend to the will of a foreign potentate? Economic competition, religious hatred, and racist pseudoscience coalesced in the idea of Catholics as a fifth column determined to uproot American institutions. Then, as now, schools became a battleground. 1 The northern states of the U.S. built publicly-funded school systems four decades before Britain. Proponents of the public schools saw them as handmaidens of republican government: training grounds for a generation of future citizens. It is no coincidence, indeed, that their emergence closely followed the rewriting of suffrage laws to enfranchise the vast majority of white men. When one Catholic leader in a heavily Irish suburb of Philadelphia tried to shield his constituents’ children from school readings of the King James Bible, then, he provoked outrage, for in the mind of Protestants, the King James was as crucial to the government of a true republic as a balanced constitution. In the fertile imagination of anti-immigrant nativists a practical suggestion soon became a dastardly and deep-rooted plot to destroy American liberty. As historians we are always tempted to look for parallels between past and present. My collaborator on the Faith and Fear in Philadelphia project, Pete David, wrote a song on the martyrdom of George Shiffler after witnessing the sanctification of the murdered serviceman Lee Rigby. Reading news of the ‘Trojan Horse’ plot reminded me of the events of 1844. Drawing direct links though is always fraught with difficulty. It would be tempting to warn UKIP that the nativists’ political insurgency proved short lived, as voters readily returned to their usual parties for national elections. Yet Nigel Farage might be cheered to know that another anti-immigrant movement, the wonderfully-named Know-Nothings, surged again a decade later not least (among other reasons) because status-anxious artisans displaced by famine migrants grew tired with two party politics. This time the insurgency sank one of the main parties (the Whigs) and left the other (the Democrats) heavily listing. But it would be just as easy to find differences between the U.S. of 1844 and the U.K. today, and learning direct lessons – and using the past to divine the future – is an easy way for historians to look silly. I do think we can learn something from 1844 though. 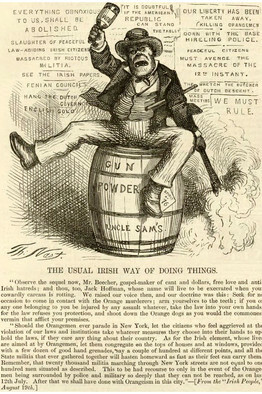 The Irish, a detested minority before the Civil War, became over the course of the next century or so standard-bearers of American patriotism, so much so that virtually every presidential candidate now needs to claim some Celtic ancestry. Most Philadelphians probably have little idea that the bars decked in Americans flags and Irish green are the descendants of taverns in which immigrants supposedly planned the destruction of free government. National identity is a malleable concept, and the Britishness defined in debates today will not be the same Britishness (or for that matter Englishness!) of a generation hence. That, at least, is something I can predict with some confidence. Andrew Heath is Lecturer in American History at the University of Sheffield, specialising in urban history, particularly 19th-century Philadelphia. You can see Andrew’s other History Matters blogs here, and find him on twitter@andrewdheath. Lea figures quite heavily in my research, actually – his papers amount to one of the richest archives of postbellum reform politics. I’ve always wondered to what extent his historical research and politics intersected.